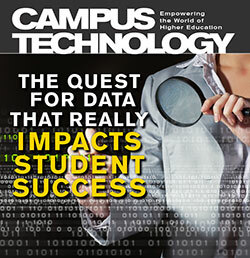 Higher ed institutions across the country are looking for ways to turn big data into learning insights. Active-learning experts explain their approach to collaborative classroom design. Inspire more student engagement in a flipped class with these two pedagogy-driven methods. Southern Illinois U is tapping a cross-institutional network for analytics to better retain students. Revamping a course for accessibility can improve learning for all kinds of students. The University of Denver saw its library renovation as an opportunity for a fundamental rethinking of the use of space and technology to support the new ways people work and learn in a digital environment. Georgia Tech’s AMAC Accessibility Solutions and Research Center is a full-service resource that supplies repositories of accessible digital textbook files, Braille, assistive software and remote captioning for students with disabilities, as well as training and consulting services. NYU’s Stern School of Business transformed its student orientation process into a two-day program focused on collaborative learning and innovative tech tools.